A handy reference guide to standard types of binding. Probably the most widely and economically used binding method. Pages are folded, collated, creased and stapled together. Used for booklets, programs and reports. 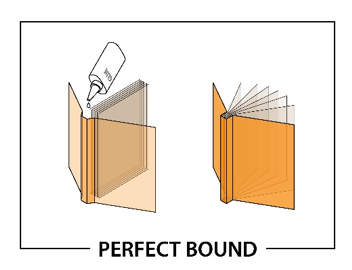 This is a basic style of binding using plastic coils or wires which are crimped through pre-punched holes on the binding edge of the book or document. Plasticoil is a similar method but using one continuous strand of plastic wire, making it very durable and less likely to come apart. Used to bind reports and catalogues, commonly used in paperback books. Text pages are collated and glued into the spine using a strong adhesive. PUR glue is a stronger gluing process; once left to cure for 24 hours helps to almost eliminate the pages falling out. Pages are folded into sections (termed 'signatures’ in the industry) and glued with a heavier printed wrap-around cover into the spine using a strong adhesive. Used for coffee-table books, specifically hard cover books. Case binding produces a flawless finish for such books and can come with or without a dust jacket. The printed pages are firstly stitched together using an automated binding machine, the pages are compressed to reinforce the binding, and then the hard cover is carefully fixed over the stitching. This is also called ‘Japanese book-binding’, but there are Korean and Chinese variants. The books are stabbed through the spine area creating 4 holes. 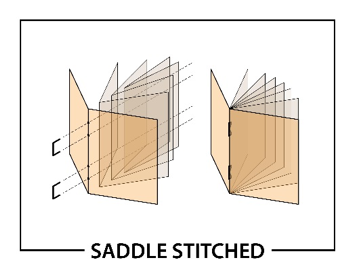 Using an awl or a similar sharp pointed object, the binder stabs holes along the left edge of a book in a straight line or more complex pattern, and then sews thread through the holes to both bind and decorate the book. Often used for portfolios or special documents where you may wish to add or remove pages. 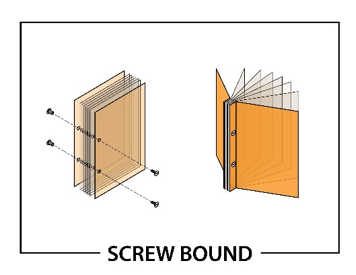 Screws are used to hold the pages between two heavier front and back covers. There are a few variations; some where the screw is seen, others where it is hidden. The visual impact of professional quality graphic design is crucial to the success of all your print products. Our designers are fast, creative and professional. We can add to your existing products or create a beautiful design from your ideas. Glide Print supply all design work from simple tasks like getting your artwork ready for print to creating complex documents such as annual reports and marketing packages. We work closely with our clients to make sure your branding is consistent and the print quality is excellent across all your products. All of our designers are based in Australia, we don’t outsource our work overseas. You receive personal attention from someone you can talk to and meet. It’s all part of Glide Print’s outstanding service to you. you're getting the best quality for your budget and the process will be an easy one for you.